Medical Knee Pads - Kneepads for Flooring, Tiling, Construction, Safety, Mining, Workwear for over Concrete, wood and even for use in roofing. Developed with health and safety in mind, giving total support to the whole knee area. Helping to prevent tendon and cartilage damage. The perfect combination of comfort and protection. New fastening system and a patented, ergonomic form. Develooped with health & safety in mind. These knee pads give total support to whole knee area, prevent tendon and cartilage damage. WITHOUT Knee Protector: there is pressure on the unprotected knee cap. 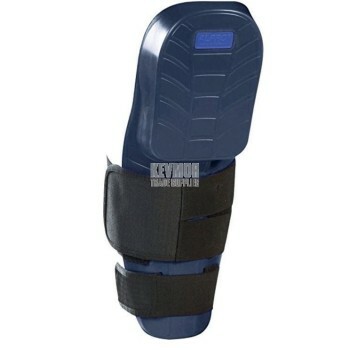 WITH Knee Protector: The knee is cushioned and given total support. ALPRO® knee protectors and knee cushions disperse topical pressure on the knee cap and facilitate work when kneeling. The ALPRO® knee protection pad is made of durable waterproof ALPRO®-foam. 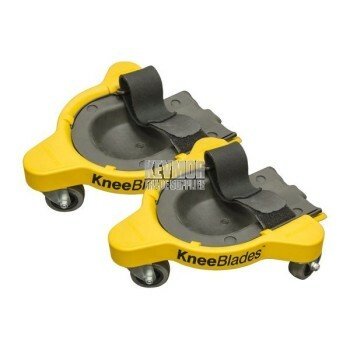 It serves to protect the kneecap and shin from pain and possible physical damage when working in a kneeling position. The ALPRO® knee protection pad stands out due to its patented, ergonomic form and its new type of fastening system which can be adjusted to all sizes. TÜV-certified protection for all work performed on the ground. The ALPRO® knee protection pad can be used for all work performed on or near the ground (e.g. in the workshop, on the building site, in the garden etc.). The material used (ALPRO®-foam) has a particular cushioning effect that makes working in a kneeling position easier. The knee pad has been tested by TÜV (German Technical Inspection Agency) and certified according to EN 14404:2004 + A1:2010 (personal protective equipment – knee pad for work in a kneeling position). Optimal mobility and improved comfort in wear. Through the special ergonomic arrangement of the Velcro fastenings the ALPRO® knee protection pad can be fitted securely and individually on to the lower leg. The Velcro straps are clear of the back of the knee, which avoids constriction and at the same time allows optimal mobility. The ALPRO® knee protection pad is also adapted to the anatomical form of the shin, providing improved comfort during wear. Perfect for every tiler, flooring installer, roofer, plumber, construction, tradesman. Comes in a calico carry bag.